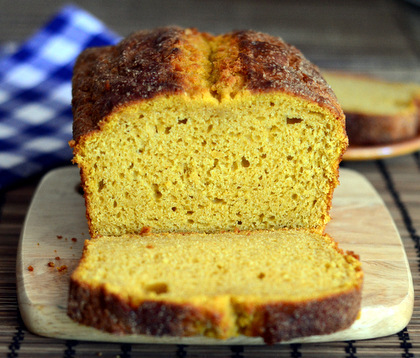 During the fall, people who haven’t baked all summer turn on the oven and stock up on flour. It’s a season to bake cakes and pies – which are delicious, but which also aren’t all that easy to eat when you’re looking for a treat that you can snack on around the house. Cookies are always a good option when it comes to snackable sweets, and these Pumpkin Spice Scotchies are a delicious fall cookie that are ideal for filling up the cookie jar that didn’t get used all summer long. The cookies are buttery oatmeal cookies that are flavored with a hint of spice and a generous amount of the seasonal Tollhouse Pumpkin Spice Chips that I picked up recently. These pumpkin-colored baking chips taste a lot like pumpkin pie and they bring a really tasty pumpkin flavor to the cookies without compromising their texture. The cookies are crisp on the edges and tender in the center, with a nice chew to them courtesy of all the oats packed inside. 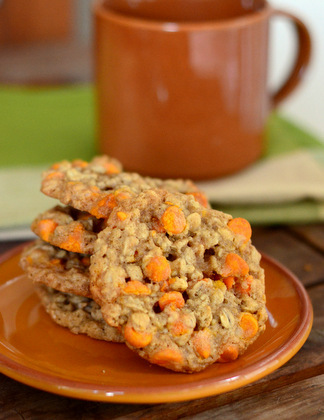 Those oats also give the cookies a pleasant nutty flavor that keeps them from tasting overly sweet, even though they’re loaded with Pumpkin Spice Chips. They’re excellent when they’re still slightly warm from the oven and they’ll make your house smell like a combination of oatmeal cookies and fresh pumpkin pie. The recipe makes a fairly large batch of cookies. Fortunately, they keep very well when stored in an airtight container, so you can keep them around all week for when those pumpkin spice cravings hit. I like to bake mine so that they have a mix of chewy and crispy texture to them, however if you prefer your cookies on the crunchy side, you can also bake these a few minutes longer until the whole cookie is golden brown before taking them out of the oven. In a large bowl, cream together butter and sugars until light and fluffy. Beat in eggs, one at a time, followed by vanilla extract. Blend in the flour mixture with the mixer on low speed, then stir in the oats and Pumpkin Spice Chips. Shape dough into 1-inch balls and place onto prepared baking sheet, allowing about 2 inches between the cookies to allow for spread. Bake for 9-11 minutes, or until cookies are golden around the edges and almost set in the center (the will continue to set as they cool). Allow cookies to cool on the baking sheet for 3-5 minutes, then transfer to a wire rack to cool completely. 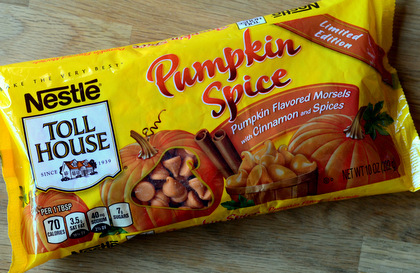 *The Pumpkin Spice Chips are a limited edition season product, and if you can’t find them, you can substitute half butterscotch chips and half white chocolate chips, and use a full 2 teaspoons of pumpkin pie spice to get a more pronounced spice flavor in your cookies. It won’t be quite the same, but it will still be tasty and perfect for autumn. 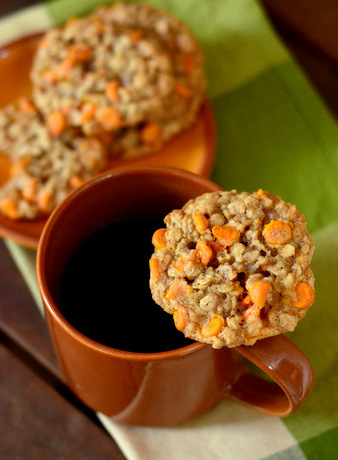 Oatmeal cookies that taste like pumpkin pie… I find the idea absolutely thrilling. Thanks for sharing the recipe. SO much yes going on here. I wonder how they might taste with butterscotch chips in addition or maybe half/half. Nice and clever variation on a classic that takes it into autumn territory!